Tuesday night Al Perry pays tribute to Jesus Acedo of Black Sun Ensemble from 6 to 10 pm on the World Famous Clambake, with special guest and bandmate Eric Johnson. Jesus recently passed on to the next celestial plane but he will be remembered by family, friends and fans for his unique spirit and as one of the most gifted and globally celebrated guitarists to come out of this dusty desert town. 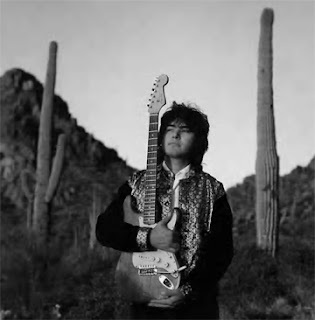 A Jesus Acedo memorial facebook page is here and here are links to articles in Blurt magazine, the Tucson Weekly and Slowburn Records. There will be a benefit concert at The Hut on April 14th.